Still waiting for a pamphlet on tailoring a men's overcoat so I was forced to sew something else for myself again! 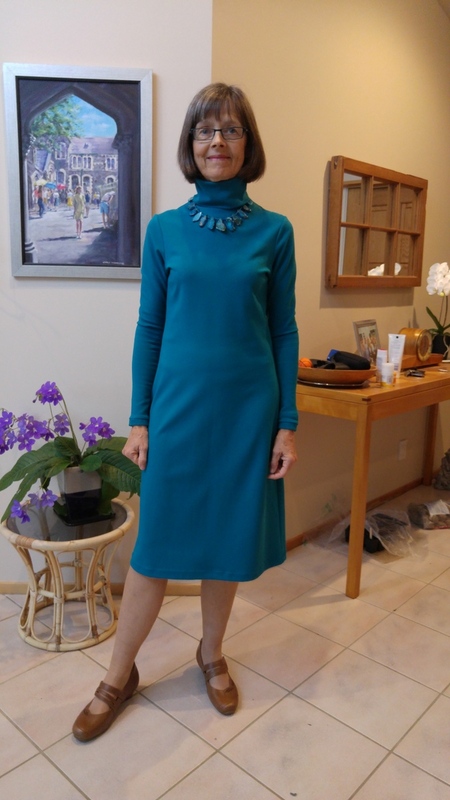 I've had some beautiful Viscose/Nylon/Lycra ponte knit from The Fabric Store here in Christchurch for about a year and I finally found the right pattern for it. It's a very basic turtleneck dress from Seamwork called Neenah. The pattern is a printout pdf so I had to do the dreaded printing, taping, tracing. I do think I am getting faster at it though. 137cm wide, I bought 2m, which was more than enough. I prewashed the fabric with a cold handwash and dried it on a towel along the top of my sofa. Soft lovely fabric. Pattern: I measure XS at bust and S at waist and hip. 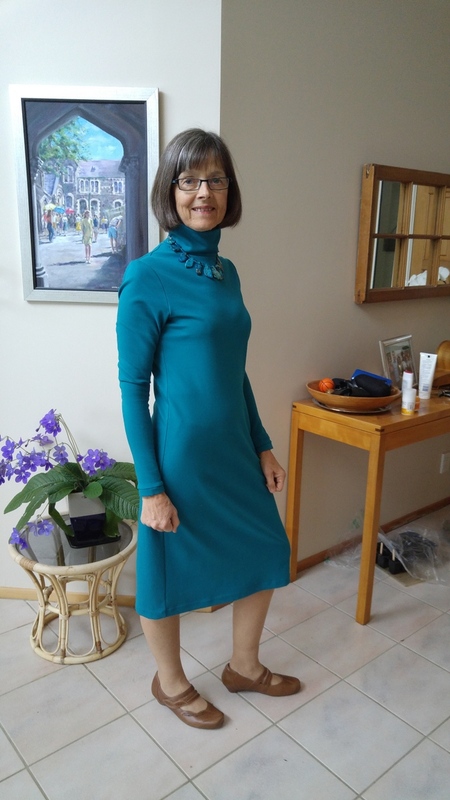 As the pattern indicated there was quite a bit of negative ease, I cut out a size S at the bust and tapered to halfway between S and M at waist then to M at hip. I cut size S for the collar and sleeves. If I made it again, I think I would go for medium for the sleeves but the collar was fine. It's quite a tall turtleneck but I have a long neck. So it might be worth shortening the collar for someone with a short neck. I didn't make any changes to the pattern and it was very quick to sew up. I used Wonder Tape on the skirt hem and top-stitched with a twin stretch needle. I would definitely consider making it again and might try it next as a shirt using a slightly shorter turtleneck collar. The dress is super comfortable and cosy.